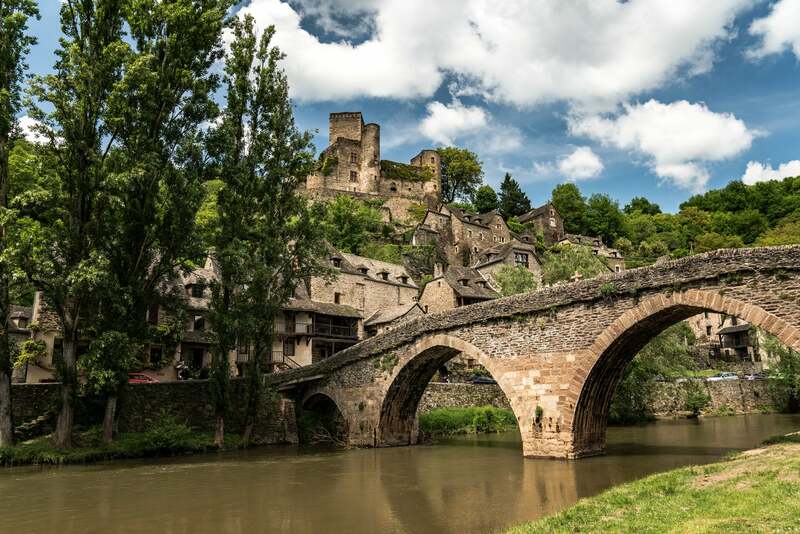 In the spring our family decided to road trip through the Midi-Pyrénées in the Occitanie and Aveyron regions of France. 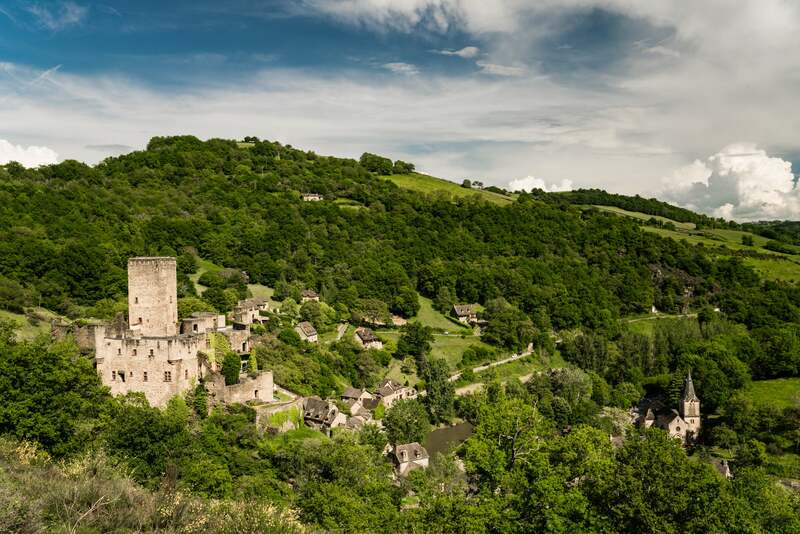 We wanted to explore and photograph two specific castles we’d heard about; Belcastel and Najac. Both of these castles are a bit off-the-beaten path and inaccessible by train, which is code for fewer tourists. Our trip was set among breathtaking vistas of rolling green hills with small castles tucked away in their valleys. Photographing a castle is like telling a story. 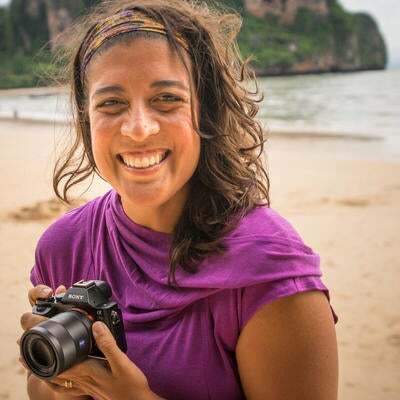 Imagine yourself going home and wanting to share your images with friends and family. What if you could only share three images? What shots would you need to tell a compelling story that convinces them to go? Every story has to take place somewhere. The first shot you want is a big, wide-setting shot. Belcastel was our first castle. The road dipped into the valley where we followed the switchbacks for almost an hour. Deep in the valley we came to a river, inviting foreigners to follow its path and discover the magic ahead. We followed the river, unsure of what to expect, and then we saw Belcastel perched above the village. There is nothing like the first moment you catch a glimpse of a castle. This is your setting shot. 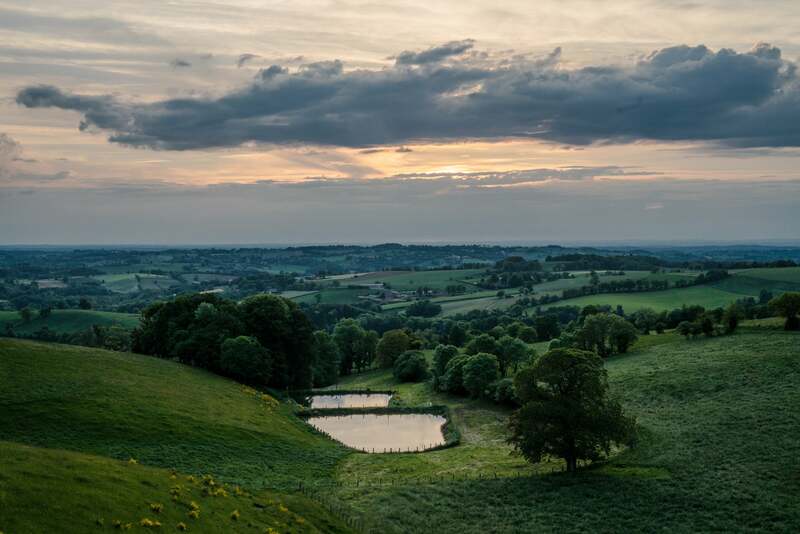 An image of a great setting is often wide and includes the surrounding landscape. Look for a couple different viewpoints where you can capture these elements. Brian and I took two different viewpoints. I crossed the bridge and decided to shoot up on the bridge, village and castle. Brian did the opposite. He hiked high above the castle to shoot down on it so you could also see the chapel on the other side of the river. Both of us had to sacrifice something. With my viewpoint, I couldn’t get the chapel in the frame. With Brian’s viewpoint, he couldn’t see the river and bridge. This is the constant tug of war in photography. Every great shot often asks you to sacrifice something. You get to choose what the sacrifice is. The most common mistake beginners make is trying to get everything in the photo. But the image ends up feeling more like a snapshot versus a striking image. When you try to take a photo of everything, your images often end up feeling like they’re about nothing. Choosing one focus helps you to look for the next shot. Once you’re inside the castle, show us what we all want to see! We all want to know what it looks like on the inside. This is your second shot to focus on. Search for a specific setting or detail. 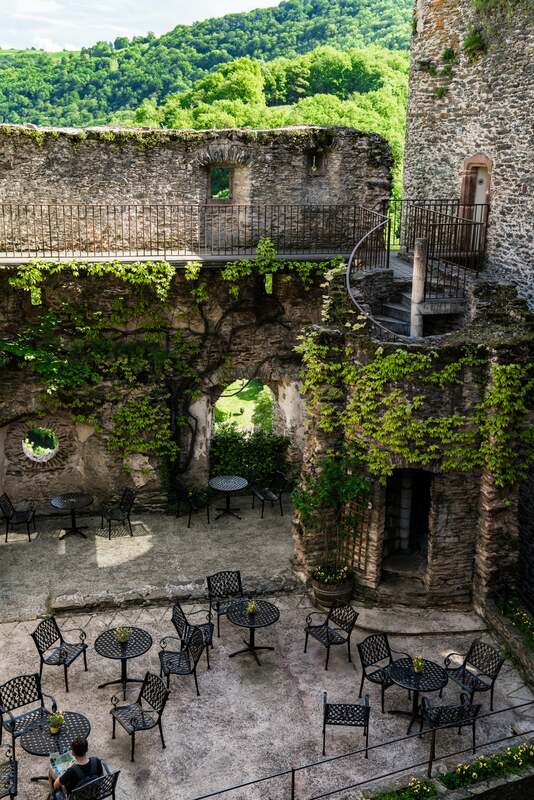 When I saw the climbing ivy surrounding the bistro chairs and tables, my heart sighed. The scene was so romantic. It was a handful of wonderful details within the setting of the inner courtyard, so I got to knock out both. My next thought was ‘How can I get high enough to shoot down on the courtyard?’ The kids and I explored the grounds until we found a hidden stairwell that took us to a viewpoint to get the shot. 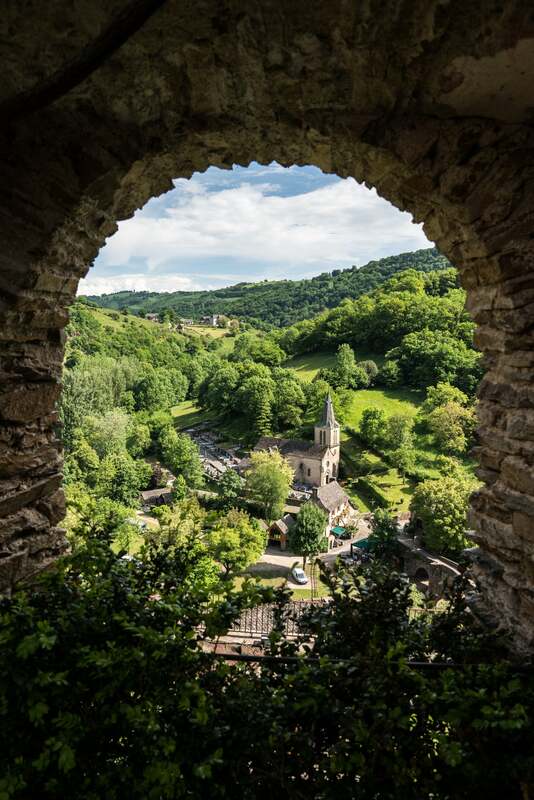 The third shot is a must when photographing a castle: it’s the epic view from the castle. Castles were built on hilltops for a reason. The lords and knights of the castle looked at a specific view every day. Take your time exploring the many rooms and corridors, checking out all the views, until you find one that stops you in your tracks. I loved this view of the chapel. You could see the chapel from a handful of spots, but I loved the composition of the stone arch above and green shrubbery in the bottom of the frame. These elements being shadowed leads our eye to the chapel versus being a wide-open shot of the chapel. Najac was a totally different experience. The road took us right to the base of the castle. You can’t get a wide-open setting shot when you’re standing at the base of a castle. 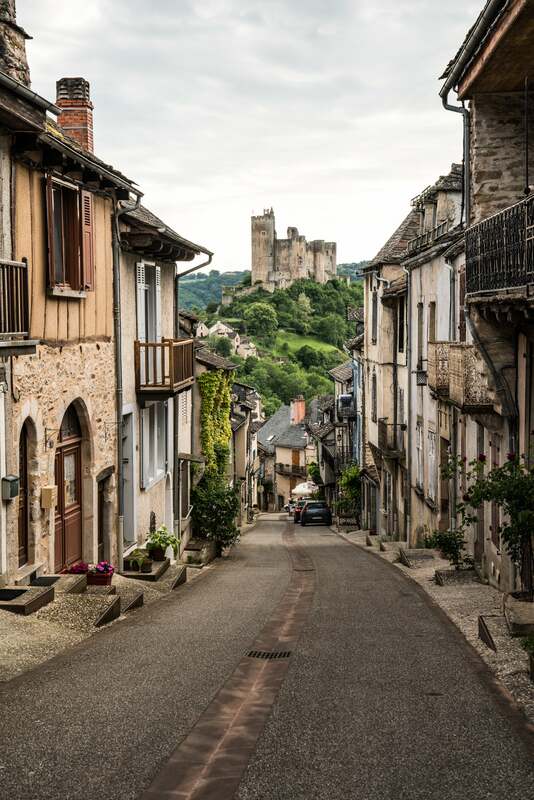 We jumped back in the car and drove half a mile away, then started walking through the village to find the perfect view of Najac. This was my favorite view. I loved the leading lines of the single road with the village on either side. They take our eye right to the castle sitting on a hill. By the time we were done shooting, the self-guided tours for Najac were closed. But all was not lost. Even though we couldn’t go inside, we could still find wonderful detail shots that show us what’s inside the village outside of the castle. 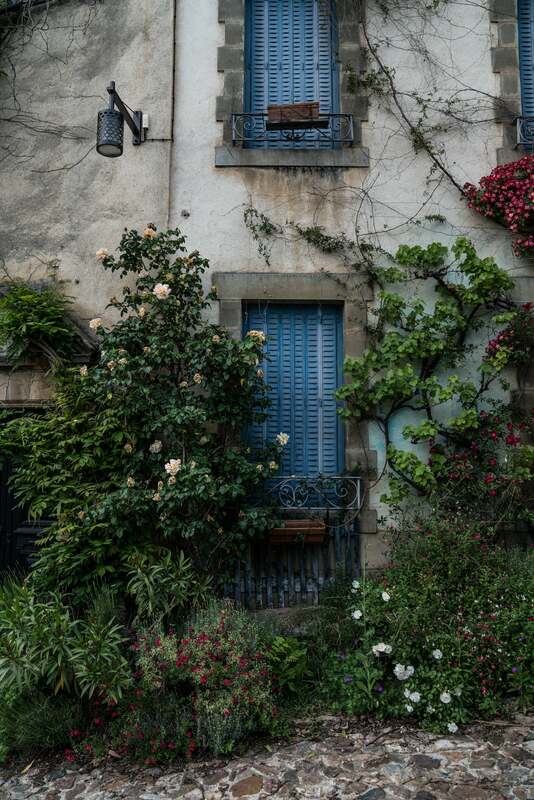 As travel photographers, our main goal is to get viewers to say “Wow, I wish I was there.” The overgrown rose bushes, ivy and painted shutters throughout the village definitely qualified for detail shots that make you want to go. As afternoon turned to evening, hues of orange lit up the sky. Brian and I looked at each other and smiled. 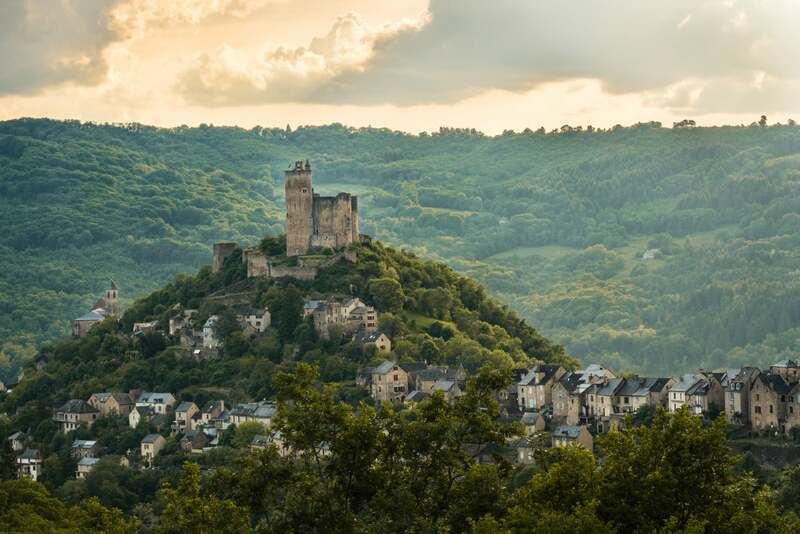 What if we got in the car and drove even farther away to find a wider perspective of this village that sits below the castle, along with the church on the far left and Najac’s castle on the top? Big ask, but we had to try! This is when you put your explorer’s hat on and turn down gravel roads that have no signs and seem to lead nowhere. You never know what you will find at the end of the road. You can see Me Ra Koh’s travel photography on display at the Me Ra Koh: A Different Life exhibit at Sony Square in New York City in August. Follow Me Ra and her adventure family at her website. Want To Beat The Crowds? All You Need Is A Little Faith.